This Layout Needs A Second Look. #Sackville Drive | Sack-Vegas!!!! OK, drivers have to pay better attention, that kinda goes without saying. 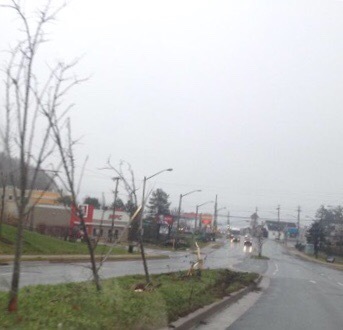 These treed islands along Sackville Drive look nice but they seem to be more of an obstacle than a decoration. Over the last couple years I have seen reports of drunks hitting them (their fault obviously) , plows, and people who simply clipped them on rainy, dark nights. I am trying to think of solutions here. Solar powered lights on each end? Remove them altogether? Posted by Sacky on November 26, 2014 in Uncategorized. I said this when they first put them in. My problem with them is that if traffic is stopped, both lanes are full and left turning cars can’t even get up to the left turning lane leaving them waiting for another light. This was a terrible traffic hazard. Not well thought out. Jamie, exactly! I can never turn left even with a flashing green because of traffic. The lane is usually empty. They are useless. I think they are great! It has stopped impatient drivers from swerving into the oncoming traffic lane just to get to the driveway they wanted to turn into. Before they were put in place I had many incidents where drivers were coming straight at me in my lane! the trees were put in to make Sack.Dr. look better. Maybe some lights. or less drunks. First off, @Axeman ‘The Brainwave’ to put the islands in was a step in trying to make Sackville look better. They didn’t put them in just to cause annoyance. Yes they can be a pain when trying to turn in to downsview because of traffic, but whats a couple more minutes going to do? A lot of thought went into putting them there, they didn’t just decided this over night, and yes money. But the Sackville business association and other community providers are trying to make Sackville the place were people love to come. Bringing more people to the community brings more money, meaning better parks, shopping etc. There are a few of these in halifax too, and they also get people constantly running over them etc. You can’t help bad drivers, if people slowed down (which are normally speeding down sackville drive) they would see them and avoid them in time. Maybe its better that drunks and bad drivers are hitting the islands instead of other people? Good grief. Sackville isn’t nice looking and I’m from Dartmouth. Forgive the business owners for trying. Trying is positive intent and good thoughts both of which are missing from the complaints in this post. When we moved here 15 years ago my wife cried and stated that it was all churches and used car dealers. Lower property values and less traffic kept us here and really, the trees are a nice human touch that isn’t “for lease” signs and concrete. Get over yourselves, they’re trees and they’re nice. I like the trees. I made the post asking for thoughts about the problem with them being moved down by cars every month or so. I agree, they are trying to make Sackville Drive look nicer and I think thats great. I think simple lighted markers would go a long way. Nice trees are fine, grant. Did look at the pic? Are those half trees nice? We need a fix here.